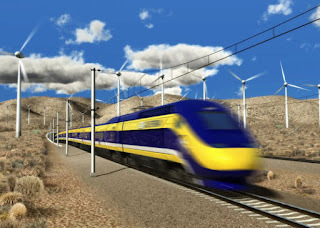 There's been a lot of debate recently about high speed rail. George Will thinks it's a grand liberal conspiracy to control people's behavior. Treehugger.com not surprisingly thinks he's dead wrong. What I've always found perplexing among the arguments against high-speed rail is the notion that one has to live near the stations to take advantage of them. People don't live near airports, but they still fly. Even so, to me it's more important how many people work near the terminals. You come into the office early to check your email and grab the materials you need for the meeting. Then the clock starts. You grab a cab or the BART to SFO. Either option is going to take you about 30 minutes (Google Maps, BART.gov). Now you push back and fly to LA. If you have to sit on the tarmac for a bit, you might be able to get some work done. Otherwise, you have to wait until your in the air to open up your laptop, and you won't be able to make calls at all. Southwest lists a travel time between SFO and LAX of 1 hour and 20 minutes. Only about 1 hour of that is actually in the air according to HowManyHours.com . Very little of that will actually be at altitude, so you're not going to have that laptop open for very long. Because LA is such a spread out mess, I don't want to hazard a guess as to where you're going. Maybe your meeting is near the airport. Maybe it's not. We're just going to arbitrarily add 30 minutes to get to your meeting. We'll assume you walk right on the train, sit down, and it pulls away form the station. Even so, let's add 5 minutes. Now you open up your laptop and start making calls and work continuously until you reach your destination, which according to the California High-Speed Rail Authority will take about 2 hours and 40 minutes. You get off the train and get a cab right away. Not knowing how the station's laid out, we'll say that takes 10 minutes. Now again, I have no idea where you're going. We'll make it a wash with flying and add 30 minutes to cab to your meeting. By flying you saved about 20 minutes, but you were able to work for all of about 30 minutes in the air when not climbing or landing. By taking the train you were able to get another 2 hours and 40 minutes of prep time done for your meeting. Now all those travel times for both options are best-case-scenario travel times. You realistically have to add another 30 minutes to Option 1 for getting to the airport and through security, and probably another 30 minutes to Option 2 for getting the train early to get a good seat. Of course that extra 30 minutes waiting for the train to leave can be spent working. Plus, we're assuming your flight leaves on-time. Only 60% of flights left SFO on-time in 2010 according to the Bureau of Transportation Statistics. We have no statistics on high-speed rail's on-time performance, but Amtrak's Acela route from Boston to New York to Philly to DC runs at a comparable 69.5% on-time rate. Marginally better, but still a wash with flying. So, both options take about the same amount of time and will probably cost about the same, but Option 2 allows you to get more work done without having to go through TSA screening. Which option do you think the average busy business professional will choose?